When searching for a medical alert system, it’s important to ask some key questions about the company, equipment and pricing terms before you make a decision to purchase. In some cases, not asking the right questions could result in being locked in to a long term contract that is difficult to get out of or ending up with equipment that is outdated and useless in your home. We receive a ton of feedback from consumers about the potential pitfalls of not asking the right questions, as well as the very positive life-saving aspects of choosing the right company. We continue to add to the list of questions you need to ask before purchasing a medical alert system. Does your medical alert system require a land-line? Today’s IN-HOME medical alert systems are built with a land-line in mind. They connect directly to the phone jack, and they make a phone call on your behalf (if the emergency button is pressed). If you don’t have a land-line to connect your base station, many companies now have a cellular-enabled base station. This provides connectivity from the base station to the call center. Your pendant button will still have a tethered range of 600-1200 feet (radius) from the base station. What is the range of the IN-HOME medical alert system? If you have a typical IN-HOME medical alert system, your emergency pendant button will be wirelessly connected to the base station (in order to alert the call center in case of emergency). The maximum distance between your pendant button and the base station is what we refer to as “range”. This range is usually discussed in terms of radius around the base station unit. The typical distances start at 600 feet (from the base unit) and some of the more robust units can accommodate up to 1,200 feet for larger homes or apartments. What about cellular medical alert systems, are those an option? Yes they are a great option for the more mobile and/or able bodied. Typically, cellular enabled medical alert systems have no range issues (as long as you have cellular service). The cellular medical alert systems are available from most providers, but understand that they do cost a bit more per month. You can take these devices with you to the mall, the gym, or anywhere you wish. Who installs the medical alert system? This is pretty self-explanatory, but let me impart a few pieces of wisdom. Generally these are pretty easy to set-up. We’ve set up a dozen or so units that we’ve tried/reviewed over the years, so they’re not too complex. IF you’re buying from a local dealer (philips lifeline has local dealers in markets around the country) they will set these units up for you. Usually however, the consumer will set the unit up and test it prior to using. Where is the call center located, and what are typical response times? Is the medical alert system waterproof? Most of the medical alert systems on the market are not waterproof, they are water resistant. This has been one of our major complaints about these little devices (pendant buttons). Bathrooms are a major source of emergencies/falls for older adults, and they should be worn while getting in and out of the tub/shower. Unfortunately, many are not meant to be submerged, so you’ll want to verify whether you can wear it while showering and/or bathing. Do you sell a device with “fall detection”? Fall detection notifies the call center automatically if it detects that the user has fallen. These pendant buttons contain an accelerometer just like your smartphone does. They send a signal based on a programmed algorithm that indicates whether a fall has occurred or not. It sounds great, and certainly has some benefits, but it’s not perfect. 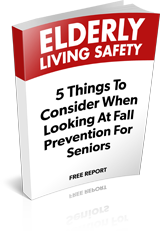 You can read all sorts of stories about fall detection devices that don’t detect falls consistently OR those that signal false positives (falls) too often. It’s up to you whether you or your loved one require this feature, but just know it will be more expensive, and won’t be perfect. What if I no longer require a medical alert system? What is the return policy? Here’s where it gets tricky… The “less reputable” medical alert companies will lock you into a long-term (binding) agreement that forces you to pay through the end of your “term”. The companies that we most often recommend all encourage the consumer to opt for monthly or quarterly terms. This reduces the likelihood of being denied a big refund. Most of the reputable companies allow you to return the equipment and discontinue the service without hassle. (IF they don’t, we intervene and/or will drop them from our recommended list). Most of the complaints you’ll see on The Senior List or on other sites concern the PRODUCT RETURN ISSUE. No matter who you decide to do business with, make sure you’re not getting locked into a long-term-agreement and make sure you can terminate at the time of your choosing. Ask to review the provider’s Terms & Conditions document BEFORE you purchase your medical alert system… It’s always best to read the “fine print” no matter how painful it is. How much does the medical alert system cost?